People always ask us which hydroponic light is best for them to grow indoor plants. The Number of lights available in the market confuses them which one to choose. Today we will review some of the best hydroponic lights that you can use to grow plants while keeping the production as low as possible. First of all, let’s check how many types of hydroponic lights are available in Canada and what people mostly use for their hydroponic growing systems. Most people use the following types of hydroponic grow lights, Later in this post, we will tell you what we are using from the last 5 years in our Hydro Garden. NOTE: Hydroponic lights only supply light to the plant for photosynthesis. You will need to feed them Best Hydroponic Nutrients to make them strong and healthy. Choose those nutrients which contain balanced percentage of micro-nutrients and macro-nutrients. You can use any of the above-mentioned lighting technology in your hydroponic garden. They are totally fine to use for growing plants. But we advise you to use the latest technology for indoor growing. If you are spending a good amount of money on hydroponic systems than using a cheap light does not give the best results. 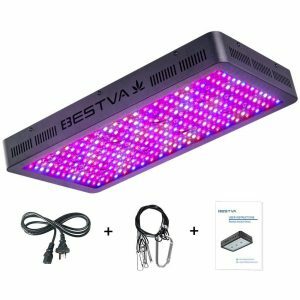 Use best grow lights with the best growing systems. Light plays an important role in all types of indoor growing methods. Do not check the price while selecting a light because high price lights are not always better and vice versa. Choose light according to your plant, space, budget, needs etc. LET’S START THE REVIEW WITH HYDROPONIC LED GROW LIGHTS. Any of the LED grow light can be used in Hydroponic growing Systems. We are not saying all LED Grow lights are same. Every other light is different from each other (in terms of quality, power, efficiency, price, durability, type of light spectrum etc). These lights are more efficient than HPS and CFL lights. Some people find these costly but the long-term use makes them highly affordable. Before saying anything about this, before sharing our own experience we ask you to click on the link below and check the star ratings on Amazon. This product from the house of Bestva receives 98% of positive feedbacks. Read the customer reviews and then choose the product. We ordered this light to replace our 2 HPS bulbs because we cannot afford more high electric bills. We need a strong product with high energy saving capabilities. 2 years ago, we received it before evening and it was Tuesday. It took 10 days to deliver because we ordered it in public holidays. First, we saw the light and think we make a mistake because we never use this much high power LED grow light before in our indoor garden. So, we were not sure about the results. Just after the 2 weeks of use, we were surprised by the results. Our plants love this light, they show fast growth and at the end of the growing process, we have more yield than ever before. It was our best investment in order to make our indoor garden more energy saving and efficient. Now we decide to change almost all our HPS bulls with LED grow lights. We are using this light from the last 2 years the product did not give us trouble. Moreover, these lights do not need any maintenance. The problem with HPS light was they burnt more frequently and we need to replace them almost every 2 months. Then a voltage stabilizer is required to supply the constant voltage otherwise little fluctuation in voltage will damage them permanently. Once the light is burnt, have to change them immediately to save our plants. They also required a separate ventilation system because while in operation they produce a high amount of heat. Installing a ventilation system will increase the overall production cost. So, there no idea to grow food indoors in small quantity with HPS light. On the other hand, LED lights do not need a ventilation system. They come with an in-built heatsink and big cooling fans. Yet LEDs do not produce a high amount of heat but still for the safety reasons manufacturers give large cooling fans. Which helps to keep the temperature of internal components in control. If you want a grow light form one of the most trusted manufacturers than this one is the best to choose. Mars Hydro has good experience of almost 10 years as per now in the LED lighting field. They make several indoor growing products and all of them are highly popular in indoor communities of Canada. A special design with a reflector which helps to reflect the 100% of light on a particular direction which increases the light absorption. 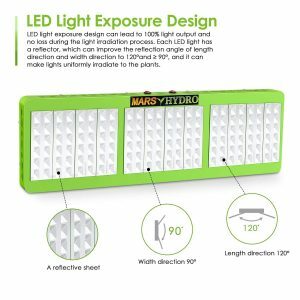 Do not worry about the quality and durability if you are choosing Mars Hydro. All their Grow lights are ETL certified like this one. 720 watts are enough for each growing stage. Some people find LED grow lights slow down their plant growth but it is not true. Hydroponic LED grow lights helps to grow plants strong and healthy. Use these lights without worrying about the results because the results will be satisfactory. The light emits 720 watts of full spectrum light by consuming only 315 watts of energy. Whereas HPS light of the same power will consume the same energy (720 watts of power for 720 watts of emission of light). Get excellent results whether your plants are in the vegetative stage or blooming stage. The manufacturer is so confident about the product quality that they give 3 years of long warranty. 1 month of money back guarantees, if you do not like the results within one month of use return it and get your money back. Sometimes they ask a few questions to know what is the problem so that they can make better products in the future. no problem in returning of product. But we are sure once you use the Mars Hydro light you will never give them back like us. I started my indoor gardening from a tiny room where I have a small hydroponic system and a Mars Hydro 300 Watt grow light. Bonus tip: Always try to maintain the constant voltage supply to the light this will increase the lifespan of Your Product. The good news is the manufacturer test every light before shipping for at least 48 hours to make sure you get a brilliant product. Their customer service is available 24 hours a day. If you have more question regarding their products visit their official website or read individual reviews on Amazon. 13789 Lumen output, A Power cord is enough long to use without facing any problem with the connections. The package includes one piece of Grow Light, One Power cord and few hanging hooks. Get healthy plants by using this light. you can grow a plant of any height all you need to do is adjust the height of light as the plant grow taller. Extremely bright light, please use sunglasses. Direct looking to the light will cause damage to your eyes. Stop using the light when you see cooling fans are not working. For trouble free use maintain stable voltage. These lights are good to use but not when you are trying to grow fruits or vegetables for more than 4 people. They are less efficient as compared to the LED lights and this is the reason you will never see them in the big commercial indoor gardens like greenhouses. But are a nice choice to use at home when growing is room or basements in small space. These lights are best if you cannot afford other lighting technology. They do not require much maintenance and if they get burnt it is easy to replace them. No extra setting is required to run CFL grow light. just buy them and plug them in your existing sockets. Most of them use Edison screw base. Sun blaster is a big brand when we talk about CFL hydroponic grow lights. They are in the industry from many years first they make ordinary light for home and industrial use than they show their interest in grow lights. These lights come in a different range of power like LEDs but they are not full spectrum light. This means they do not emit the full spectrum of light. In the case of LEDs, they emit the light wavelength similar to the sun and this is the reason a single piece of LED light is enough for growing any plant of your choice. CFL grow lights are good for VEG stage and for bloom you need to shift to HPS or LED lights. This increases the cost of production. Another problem that indoor growers face with CFL lights is they do not emit the straight angle of light. This means the light emitted by CFL has 360 degrees of an angle which through the light in all directions. This increases the loss of light and to overcome from this problem you need to attach a reflector with the light which gives an angle to the emitted light. If you are planning to use these lights, we advise you to choose at least 200 watts less than this will not work on plants. Till 2014 we use many CFL grow lights in our different small indoor gardens because the LED lights were costly at eh time. But nowadays they are quite affordable and now we have all the LEDs in our hydroponic garden. There are only a few HPS lights in it which we will change very soon. 250 watt CFL grow light with dual spectrum is good to star with. This grow light is a perfect choice for beginners. We do not advise beginners to spend lots of money on growing equipment. Because many of them drop the idea of indoor growing. Some do not have enough time to take care of plants while others find it hard or difficult for them. If you are new or just going to start indoor growing choose this light it is not costly like other lighting technology. If you find indoor growing funny and suitable for you then move to better products. If not then use this light anywhere as a simple light like you already have in your house. All CFL lights are not same some need additional ballast but this product does not need ballast to run. It has its own ballast which is installed in it at the time of the manufacturing process. Dual spectrum means the light emits dual spectrum which is good for veg and flowering stage. Do not compare it with LED lights they have a different bandwidth of light wavelength and they are full spectrum lights. Users say they are happy with the results. The continuous use of light gives them excellent results but only in the vegetative stage. The company claims that it is also best for flowering but in an actual condition, we have found that it does not help in flowering. There are some CFL bulbs which help to grow healthy and strong plants but not alone. Fertilizers and environmental conditions also contribute to their growth. Grow light only is not everything when it comes to growing plants without sunlight. The traditional method of growing is using soil and sunlight for photosynthesis. To grow them using various techniques require various caring tips and tricks. It looks simple to grow plants at home but believe us it is not that simple as you think it is. Proper care on time is must otherwise plant will die few days (due to disease or lack of care). In this post, we are not saying CFL hydroponic lights are not useful. Our responsibility is to spread the right information which is an experience based. Companies always claim that their products are best but we all know the results everybody get are not the same. We encourage you to use these bulbs if you want to check whether you are able to grow fruits and vegetable indoor or not. Now it’s time to talk about the HID grow lights which you can use in hydroponic growing systems. HID stands for High-Intensity Discharge Grow Lights. They have high lumen per watt this makes them favorite indoor growing light for hydroponic systems. 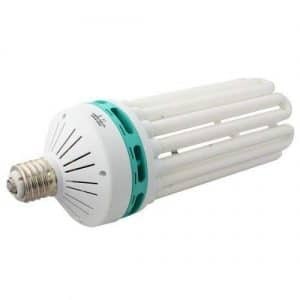 There are many types of HID bulbs in the market but only High-Pressure Sodium Bulbs and Metal Halide emit lights which are suitable for plant growth. They are widely used all over the world for indoor growing. Vivosun is a trusted manufacturer of grow lights and other growing equipment. They are in the business for many years. They experience to make them no 1 company in Canada and USA. 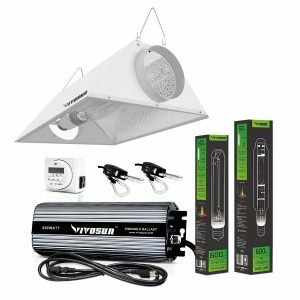 The product that we are discussing is a Vivosun 600 watt grow light that is perfect for hydroponic gardening. The reason is simple it is affordable and moreover it is highly efficient. All HID lights produce high lumen per watt. With this particular product, you will get one HPS bulb and one MH bulb both are sufficient for growing perfect plant with extra yield. Do not underestimate the growing power of HPS and MH grow lights. Where CFL and LEDs do not work people use these lights they work everywhere but the condition is they need a good ventilation system. Because they produce a high amount of heat which is not good for your grow light as well as for your plants. To reduce this high heat energy, you need a good ventilation system along with this lighting technology. now you have two different systems ventilation and lighting system to grow plants. It is costly to maintain both the system together. If you are growing in large quantity than this works best otherwise it is not wise to spend a high amount of money on them. Use LEDs instead. Hydroponic growers normally use LED or HPS grow lights. LED can be waterproof but not HPS or MH grow lights. You cannot operate them in wet conditions as this will damage the system. The entire power of the system is depending upon the ballast. If you use MH or HPS grow lights with non-compatible ballast then this will only cause problems. This product comes with its own compatible ballast which is of 600 watts. The manufacturer gives 3 years of warranty on ballast only. Hps lights increase the electricity bills so use them if you do not have another option. The diameter of air opening on both sides is 6 inches which are enough to install a big cooling system. Duct fans are a good option to make your light cool and protect your pants from an excess of heat. 2 separate timer controllers which make you able to control the light according to your needs. 7-day controller, 600-watt digital ballast, 600 w hps light, 600w metal halide bulb, rope hangers are all included in the kit you do not need to buy anything extra from the outer market to install the light. Please remove the blue film from the reflector before using it. The surface of the reflector is highly reflective which reflect the almost 100 % of light back to the plant which increases the absorption rate. Remember more light absorption means better photosynthesis which results in nice growth and high yield. This light is an investment, not expense because iPower 1000-watt HPS MH grow light to cover all light needs that you plant ever needs. With this product, you do not need to buy other lights to promote plant growth. Absorption of light is depending upon the type of light that grow light through on the plant. The light is perfect for seeding to flowering so you are good to go with this light. it has double power reflector. The reflector reflects the light on the plant with a high power which stimulates the plant growth by encouraging the photosynthesis. You can mount this light in grow tent or anywhere in a grow room. 1000-watt digital dimmable ballast is perfect to use for a complete growth cycle. you can adjust the intensity of light by adjusting the button given on the ballast. It has an internal protective circuit which protects it from short circuits, power surge. Do not worry about the overheating, in case your ventilation system stops working the light has an inbuilt protecting system which will protect it from overheating. 2 years warranty, CE certified and UL listed ballast. Both lights are made with high-quality material use them according to the growth cycle. if you are not sure which light you need to use first then HPS is the light that you need to use first and by observing the growth and shift to MH light. Do not put this light too close to the plant his will damage the plants permanently. The product produces an excess of heat energy if used in the sealed container like grow tent make sure you have installed a good cooling system. MH light stimulate the vegetative growth as it has the blue and violet light spectrum which is proved to improve the veg growth cycle. The manufacturer gives 12 months warranty mechanical timer and is UL listed. You can use the timer with any of kitchen appliance and other grow lights.